There was immersion, there were interventions, there was innovation, and there was certainly impact. i-Docs 2018 proved a rich, intense, fruitful and inspiring event for presenters and attendees alike, running over three days from Wednesday 21st to Friday 23rd March. To begin at the end – it wrapped up on the Friday evening with an enthralling and fast-paced talk from Kamal Sinclair, Director of New Frontier Labs at Sundance Institute, on her in-depth research project Making a New Reality. Sinclair’s talk was brimming with insights on how we might improve equality, equity and diversity in emerging media, and was the perfect note on which to end three days of i-Docs. 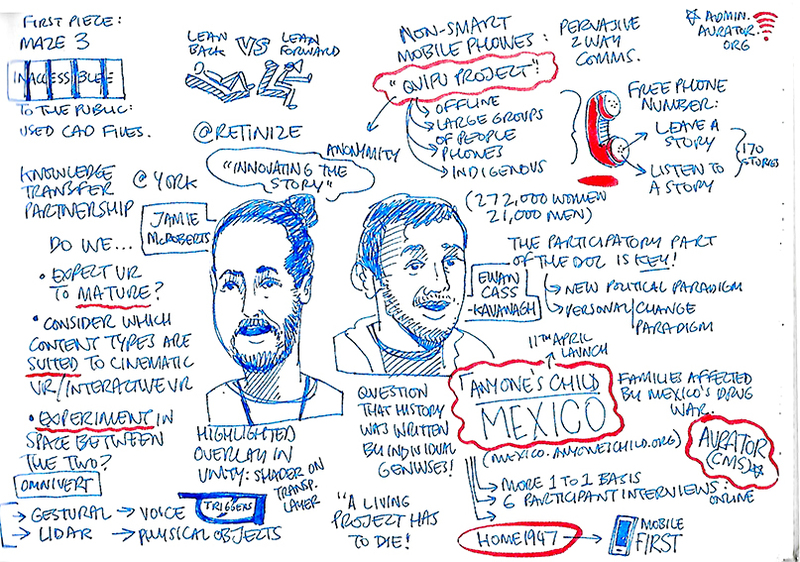 For just a brief selection of these insights, check out the fabulous live sketch of the talk above, by Dan Archer. 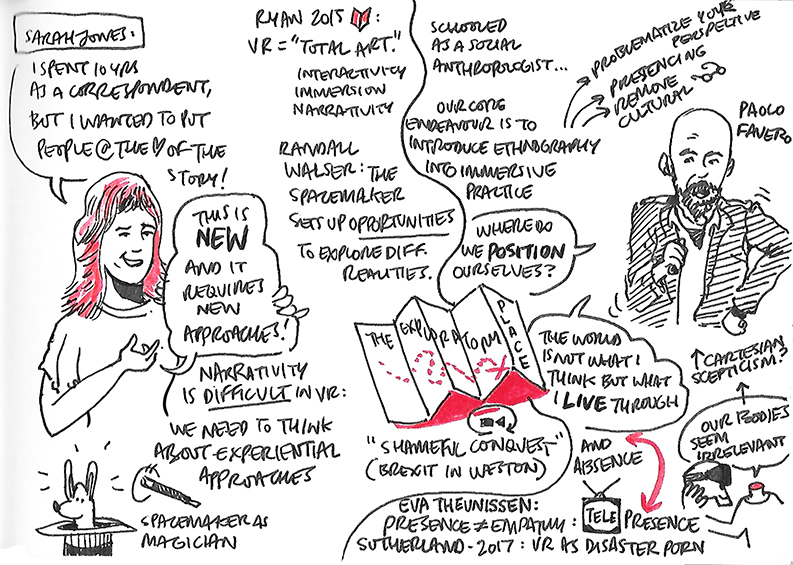 Archer, who was at i-Docs to present on his work with Empathetic Media, also put on his graphic journalist hat for us during the conference, and created these evocative live sketches during a number of the sessions. Videos of most of the keynotes will be posted on this site over the coming weeks, so do check back regularly. In the meantime, Archer’s sketches do a fantastic job of capturing the essence of some of the sessions. Scroll down to see more, and we’ll load more soon in a separate post. 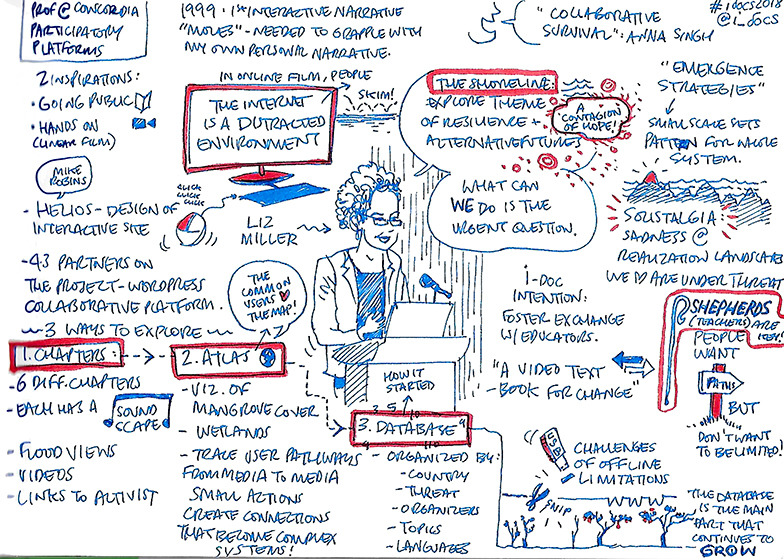 For an alternative summary of a number of the sessions at i-Docs, presenter Robin Kwong of the Financial Times also captured notes from a number of sessions and has published them on his blog here. These sketches are licensed under a Creative Commons Attribution-NoDerivatives 4.0 International License.